A 23-year-old woman of Ethiopian descent claimed that the driver of an Egged No. 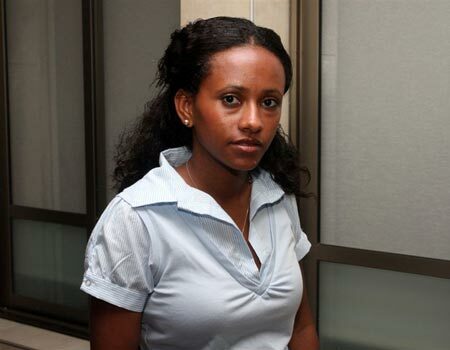 5 bus in Tel Aviv refused to allow her to board his bus because of the color of her skin. Speaking to Ynet, Yedno Verka recounted last Wednesday's incident: "As I prepared board the bus, the driver suddenly shut the door. I banged on the glass, but he ignored me. Then a young woman came running towards the bus, and he opened the door for her. I stayed close to her and boarded the bus. "When the driver saw me he said, 'what, don’t you understand that I don't allow Kushim (derogatory term for black people) on board? Are you trying to smash my door in? Were there buses in Ethiopia? Why don't you walk? In Ethiopia you didn't even have shoes and here you do, so why don’t you walk?' I was shaking all over; I couldn't even speak," she said. At this point Verka handed the driver the bus fair, but, according to her, he refused to accept it and said, "Kushit hold on, what's your hurry? Since you (Ethiopians) made aliyah you've become arrogant." Verka said she responded by saying, "You can't treat me this way. Treat your mother this way." Only then did the other passengers intervene and call the driver out for his racist behavior, said the woman, adding that the driver continued his tirade even after she made her way to the back of the bus. "I told myself that I would not cry in front of him. As we approached the college I rang the bell and got off. I couldn't hold it in anymore and began to weep. "It was such a humiliating experience, and what scares me most is the thought that he'll continue to act this way. I would sue him had jotted down the names and numbers of some of the passengers, but I didn’t even think about it," said Verka. Knesset Member Shlomo Molla (Kadima) turned to Transportation Minister Yisrael Katz (Likud), who in turn instructed his office to demand that the Egged bus company investigate the incident and see to it that the driver is punished if it is found that he acted inappropriately. Egged said in response that it "condemns any expression of racism and services all people, regardless of race, gender and creed. The details of the incident have been forwarded to Egged's control committee for an in-depth investigation. Should the allegations prove true, Egged will act accordingly." this is sad. but this is not new evrywhere in the world black people always discrimnate by white people. I hope one day this will stop. You know its such a shame, I've been to Tel Aviv its so beautiful there but I also noticed people looking at me a little funny. I ignored it of course I was just visiting but I can't even begin to imagine what it's like to live there. Don't get me wrong I was fortunate enough to encounter very friendly people there as well, but I'm not naive, I understand why some of them were looking at me the way they were. Best Free Online Games on the web.